I got this phone from my dad after he used it for 1 year. Samsung phone starts degrading after 1year. Works well for one year just like any other phone. Post 1 year of usage, it slows down. Too much lag is experienced even if you reinstall the OS. Not worthy at 37k. Instead go for Coolpad or Redmi phones around 15k. Overall a good choice smartphone in the higher range. Almost all features are top notch and satisfactory. Choose other brands if not limited to Samsung. Good competitors out there. Frequently Restarts after getting old. Heating issues and Battery problems. This is a really good phone for the ones who like big screens. The display is too good to be true as its Super Amoled. The multitasking happens really fast with 3GB RAM and a great processor. Samsung feels good to carry in hands. 5 Pricebaba users have written their experience with Samsung Galaxy Note 4. If you own Samsung Galaxy Note 4, please do leave your feedback too. Samsungs Note series is known to be popular among power-users who like big screens and styluses. The new Note 4 does more than youll expect from a smartphone. The biggest upgrade from last years Note 3 is that finally its built with an aluminium frame, thus offering a premium, elegant look and better-built quality. Also, Samsungs added a fingerprint scanner on the front and a heart rate monitor at the back, like they had in Galaxy S5. The Note 4 offers top-off the line hardware. The display is now a 5.7-inch Quad-HD (1440x2560 pixel) Super AMOLED with a pixel density of 515PPI. For India, the phablet comes with a 2.7GHz quad-core Snapdragon 805 processor coupled with 3GB of RAM. The rear camera is a 16-megapixel sensor with OIS (Optical Image Stabilization) that also does 4K video @ 30fps (3,840x2,160 pixels) and 1080p video @ 60fps. Theres a 3.7-megapixel F1.9 lens camera in the front. Samsungs new S Pen stylus has been upgraded with improved pressure sensitivity, Smart Select feature, calligraphy and signing pen writing options. On the software side, the phablet is loaded with all Samsung S Pen stylus apps as part of the whole TouchWiz UI and Android 4.4 KitKat lies underneath as the OS. It comes preloaded with support for 14 regional Indian languages, including Hindi, Punjabi, Bengali, Gujarati, Urdu, Tamil, Telugu, Malayalam, Kannada, Marathi, Oriya and Assamese. The phablet also has a fingerprint sensor and 3 mics for directional voice recording. 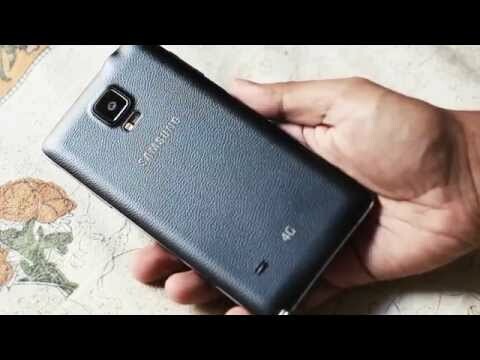 The Note 4 has 32GB internal storage which can further be expanded up to 128GB via microSD card. It also packs in a huge removable 3220mAh battery with fast charging which according to the company charges from 0 to 50 percent in 30 minutes. It comes with every connectivity option like Wi-Fi 802.11 a/b/g/n/ac (2X2 MIMO), NFC, Bluetooth v4.1 (BLE), USB2.0, MHL 3.0, IR LED (Remote Control), 3G / 4G and supports VoLTE as well. It will be available in Charcoal Black, Frost White, Bronze Gold, and Blossom Pink colours. The Note 4 is for stylus and big phone lovers and theres no real competitor to this power product from Samsung.